Place card holders are an important element to a wedding or any other special dinner event. You can either purchase the holders or make your own that are custom to your taste. I’ll show you how I made these wedding place card holders with a little repurpose. 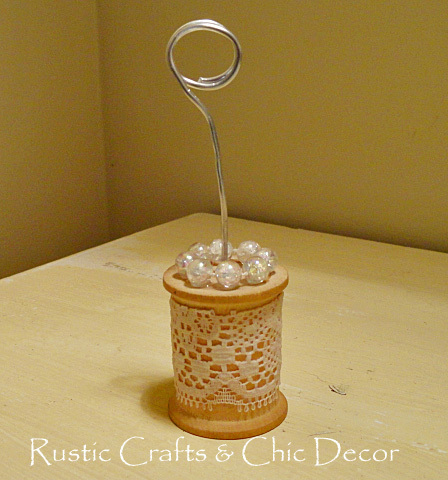 For these holders, I use vintage spools as the base. 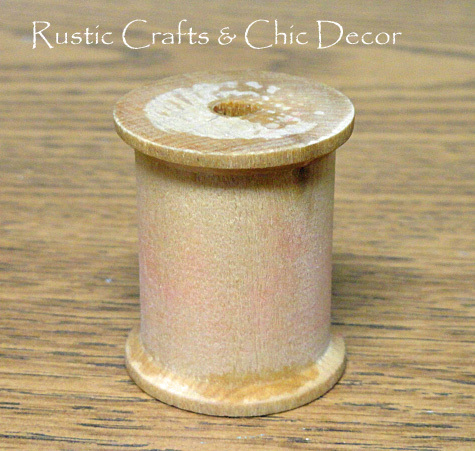 Spools are fairly easy to find at antique stores and flea markets so you shouldn’t have a problem coming up with enough of these to make a set of table number or wedding place card holders. Prepare vintage spool for craft project. 1. Remove the label and any remaining thread from the wooden spool. Use a wet cloth, Goo Gone or sandpaper to help with the areas of the label that are hard to remove. Insert clay into the bottom section of vintage spool. 2. To plug up the bottom of the spool, insert a small amount of clay about a half inch into the bottom of the spool. 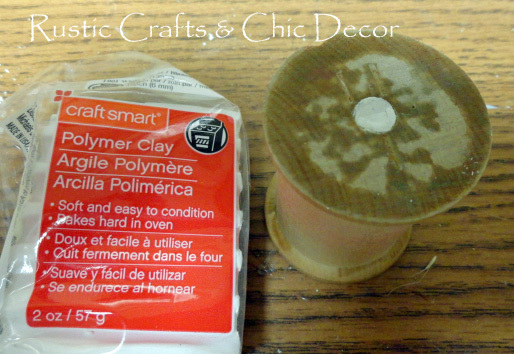 If you are using a soft clay that needs to be baked to harden, like I did, you can simply add a coat of mod podge decoupage to the bottom of the spool to seal it. Otherwise, use clay that will harden with the air. 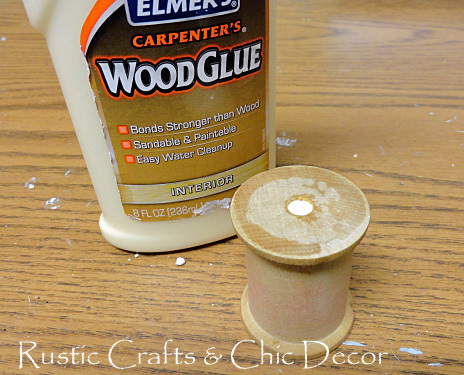 Fill top of wooden spool with wood glue. 3. Fill the vintage spool almost to the top with wood glue. Cut a section of your floral wire, about 8 inches long, with a tin snips. Wrap one end around a cylinder object that is about a half inch in diameter two and half times. I used a large paint brush. Insert the straight end into the spool until it pokes into the clay bottom and can stand straight. Don’t let it go all the way through the clay. The wood glue around the sides will dry hard like wood and keep the wire in place strong and secure. 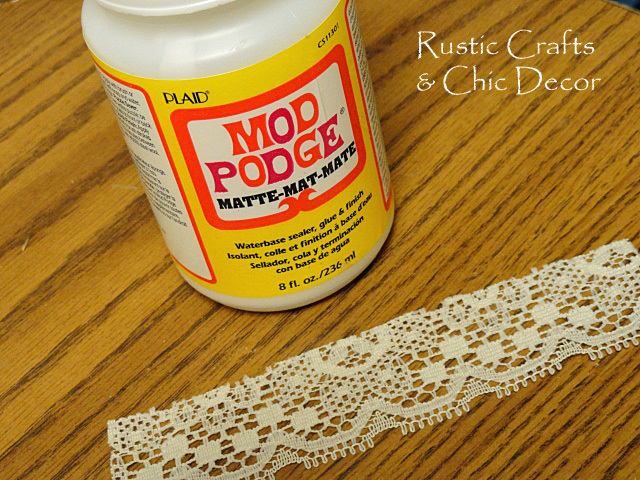 Mod Podge a section of lace onto the vintage spool. 4. Cut out a section of lace that is just a little smaller than the inside width of the spool and can wrap all the way around with about an eighth of an inch overlap. Paint on a layer of Mod Podge onto the inside wood of the spool. Now press the lace onto the spool with the Mod Podge holding it in place. 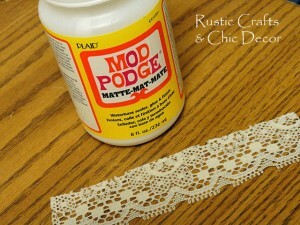 Apply another layer of Mod Podge over the lace to finish it. I used a matte finish. 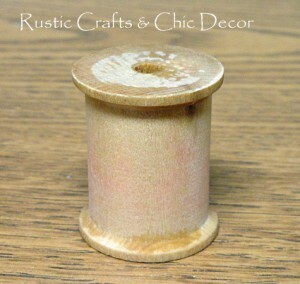 Glue faux beads to the top of the spool. 5. To add some interest to the top of the spool, cut out a small section of faux pearl garland. Make it just long enough to form a small circle at the top. 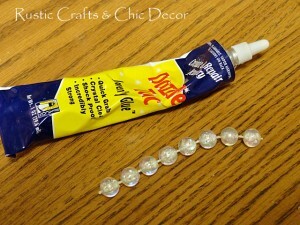 Using a quick tack jewelry adhesive, adhere the pearls to the top of the vintage spool. A vintage inspired place card holder for a wedding. That will be a great way to use them Brenda! Have fun! That would be great Katherine! I didn’t realize you had a wedding blog and I’m anxious to check it out!